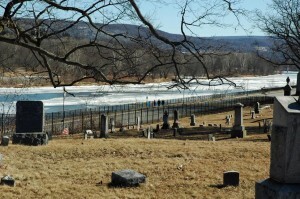 The Susquehanna River at Towanda has been on the move since Thursday, when Marguerite Fox Picou snapped these photos from her unique perspective next to Towanda’s Riverside Cemetery, the Association of which she serves as president. 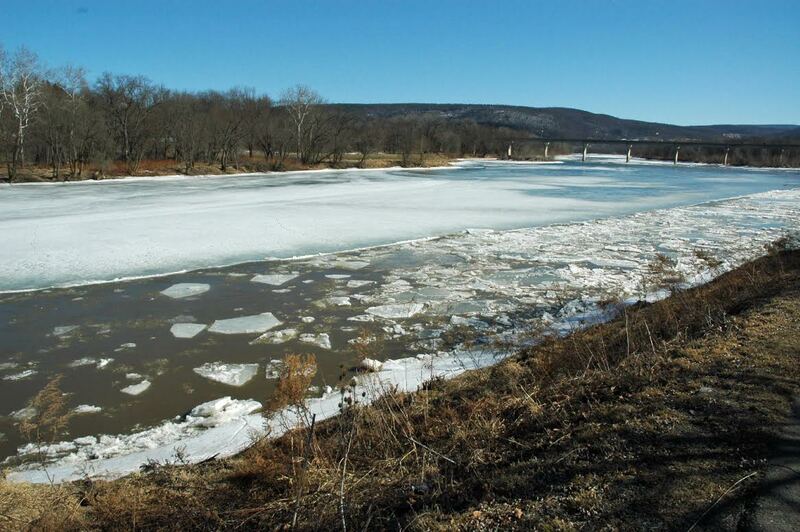 As reported at EML yesterday, the river ice at Tunkhannock is holding fast, with slowly rising waters actually flowing over the thick cover rather than breaking it up. The same is true at Laceyville and Meshoppen. At Towanda, however, the river began to break up yesterday, which means that a flow of ice sheets has already begun its trek downstream. 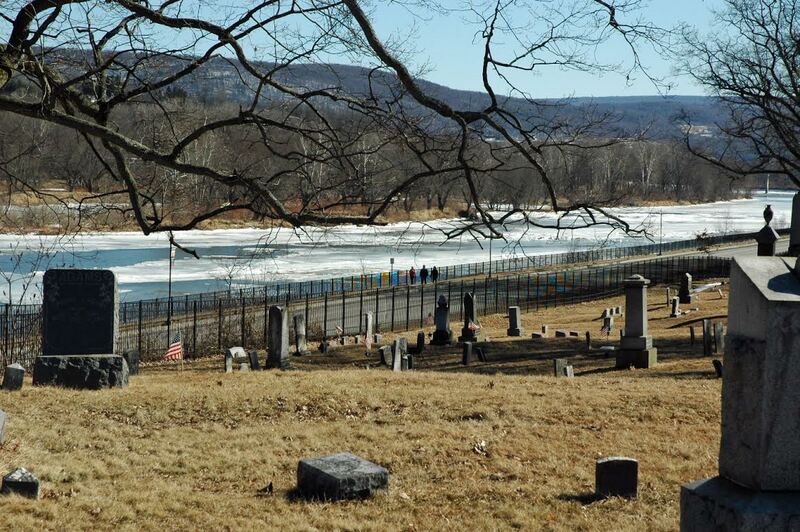 Due to the ice flow, river readings at Towanda fluctuated wildly throughout the day on Friday between 2 and 4 feet, with flood stage being 16 feet. The river is currently expected to crest there at about 8 feet at noon on Sunday. Most weather outlets predict temperatures to remain above freezing through Sunday evening, with significant widespread rain between Friday evening and Sunday afternoon. Forecasts throughout the day on Friday have slowly increased the expected precipitation amounts to about an inch of rain for all communities in the Endless Mountains along the Susquehanna River watershed. 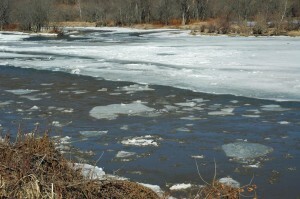 Inevitably, as streams fill and flow into the river on Saturday, the integrity of the ice will be compromised, forcing it upward and outward. Ice flows are incredibly unpredictable and, even with the river level being relatively low to begin with, jams can occur with little advance warning along narrow stretches and bends in the river. 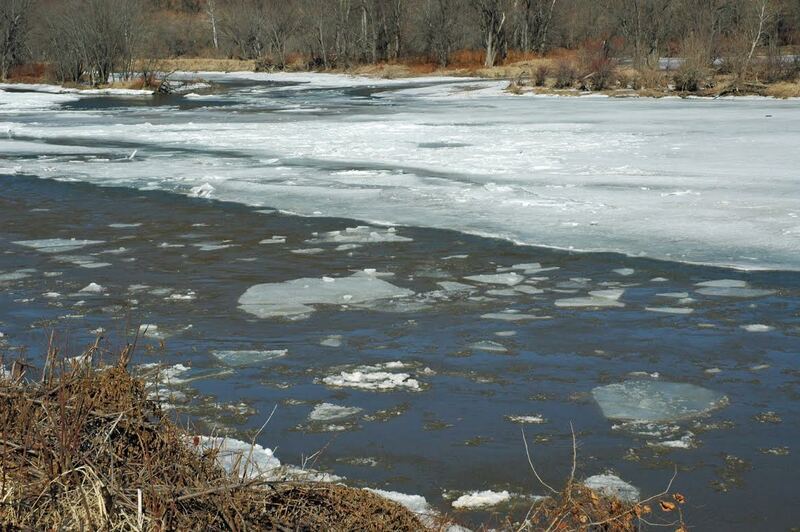 When ice piles up, fast-flowing water can rise quickly behind the jam and will seek the path of least resistance. There are currently no flood watches posted for the region, but the situation requires vigilant monitoring by emergency management officials and all residents prone to flooding. At Meshoppen, the river is already over 12 feet, with a crest of nearly 19 feet expected late Sunday evening. Unfortunately, there is no monitor along the Susquehanna River at Tunkhannock. Tunkhannock Creek, however, which enters the Susquehanna near the downtown river bridge is expected to rise from 3 to 8 feet between now and 8 pm on Sunday. Residents downriver from Tunkhannock, especially in the Falls area, should be particularly aware of the potential for flooding of low lying areas any time between Saturday and Monday, as the river at Wilkes-Barre is expected to crest near 18 feet on Monday morning, the flood stage there being 22 feet. EndlessMtnLifestyles.com invites readers to submit photos and video clips obtained from safe vantage point along the river throughout the weekend. You will be credited for your submission.